On the third day of Tigard High School's annual spring break baseball tournament, the Oregon City Pioneers enjoyed one of those games where almost fell their way. 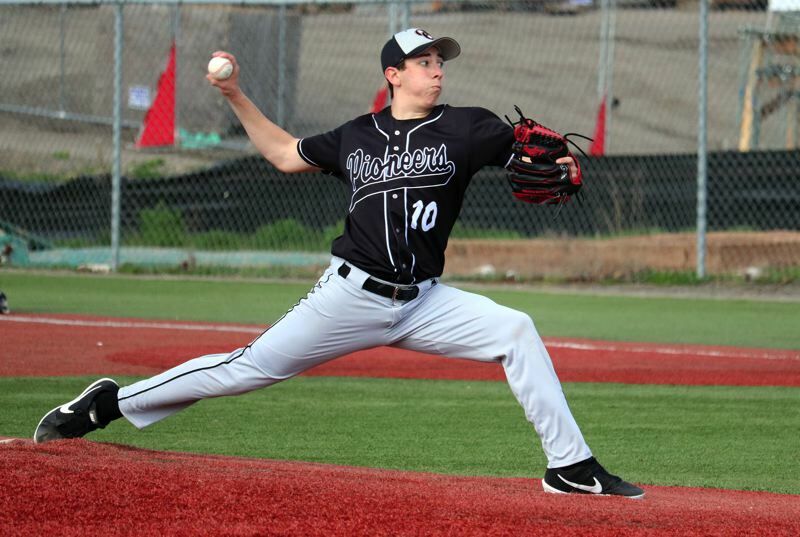 The rain stopped, the sun came out, senior right-hander Christian Mansfield was on the mound, the defense made timely plays, the offense came up with timely hits, and the Pioneers rolled to a 9-0 win Tuesday over the Sheldon Irish. "We had a great team win today," said Mansfield, who went the distance, scattering six hits with no walks and six strikeouts. "I felt pretty good. It was a nice, warm day, my arm felt good, and I knew I had a great defense behind me. "I just had to pitch to contact and let the rest of it take care of itself." The Pioneers gave Mansfield all the run support he needed in the first inning when they scored four runs on three hits, one walk, two fielders' choice, a sacrifice fly, and two Sheldon errors. In the fifth, Oregon City added four more on four hits, including Jordan Weseman's two-run triple to left field that scored Zach Rummel and Connor McAlbin to give the Pioneers an 8-0 lead. The Pioneers tacked on a run in the seventh when Michael Bedell reached base on an error to lead off the inning and then came around to score on Robert Boland's two-out double. The Irish had their chances to score, but left two runners in scoring position in the first inning when Mansfield got clean-up hitter Isaiah Lugo to pop out to shallow right and then retired Eli Seno on an inning-ending strikeout. Sheldon threatened again in the fourth when Taylor Langworthy reached on an infield single and then went to third on Quincy Spurlock's two-out, ground-rule double, but both runners got stranded when Mansfield struck out Nate Brown, who went down looking. Oregon City's defense stepped up in the fifth inning when center fielder Dalton Welch made an impressive catch to rob Sheldon's Calin Morgan of extra bases in the fifth, and again in the sixth Weseman touched off an inning-ending, 6-4-3 double play. In the seventh, Welch made a strong throw from center field to end the game, erasing Brown as he tried to stretch a two-out double into a triple. "We're still a work in progress," Pioneers coach J.J. Winkle said. "We've still got to clean up some things, but we're learning." Oregon City graduated six seniors from last season's team that went 8-9 to finish fifth in the Mt. Hood Conference and then lost to West Salem in the first round of the OSAA Class 6A state playoffs to finish with a 13-14 overall record. As the Pioneers prepare to rejoin the Three Rivers League this season, they return only a handful of players who saw significant varsity playing time a year ago. That may make them younger and less experienced than most of the other six teams in the Three Rivers, but that's no reason to think that Oregon City can't compete for one of the league's three automatic berths in the playoffs. "We're a bunch of scrappers," Mansfield said. "I mean, we've got a lot of young kids and a lot of seniors that want to come and play baseball every day. "Playing in the Three Rivers means more competition and definitely tougher teams, but we're looking forward to it. We love good competition." Through six non-conference games, the Pioneers are 3-3, offsetting losses to Grants Pass, Century, and Churchill with wins over McMinnville, Newberg, and Sheldon. "We start only two or three seniors, so we're inexperienced, but they like to practice and play hard, and they like being here," Winkle said. "That's all I can expect. "There's a ton that we need to do to get better, but I think by the end of the year we'll be a better team than what we are right now. We're still going through some growing pains, but by the end, we'll have some guys that have some experience. "Hopefully, we can win a few games and get into the playoffs. Once you get in the playoffs, you can make anything happen. We've done it before." Mansfield, one of nine seniors on this season's roster, said the thing that has impressed him the most in non-conference play has been the Pioneers' hitting. "We made some adjustments over the winter as a team and that's really what we're trying to focus on — hitting," Mansfield said. "We know our pitching and defense is going to be there, so if the hitting is there and we can jump on teams early, we feel like we have a good chance." Mansfield has a team-high .417 batting average (5 for 12), followed by Welch at .353 (6 for 17), and clean-up hitter Zach Zumwalt at .333 (4 for 12) with a team-high six RBIs. The Pioneers also are getting steady production out of the leadoff spot from sophomore third baseman T.D. Davison, a transfer from Mississippi who is batting .286 (6 for 21) with four runs scored. "T.D. is another one that loves to play and is full of life," Winkle said. "He's not afraid to win the bat and he puts the ball in play. He's not your typical leadoff hitter who will take a lot of pitches. He goes up there ready to swing. "He gets it going for us. He already has started a lot of balls games by getting on base, and when he does that, we have a chance to score early." Oregon City used eight pitchers in the first six games, with Davison, Mansfield, Rummel, and Weseman logging the most innings, while Brandon Richardson, Johnny Rotter, Ashton Stalheim, and Welch have each seen spot duty. The Pioneers are scheduled to kick off Three Rivers play next week with a three-game series against Tualatin (5-1-1) beginning Tuesday at Tualatin. The series continues Wednesday at Oregon City, and the final game in the series is Friday at Tualatin. "I'll tell you this, we'll play hard," Winkle said. "I don't know what that means. I don't know how many wins that equates to, because the Three Rivers League is tougher than hell. But other teams will know they're in for a game when they come to play us. "And that's what we want. In baseball, anybody can beat anybody."